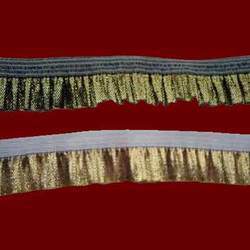 We are a leading Manufacturer of decorative frill lace from Surat, India. Innovation in our forte, we are able to put forward premium grade Decorative Frill Lace. Our designers manufacture the range in varied colours and designs so as to meet the specific choices of the customers. These frills are widely used for enhancing the look of sarees, ladies suits and other embroidered apparels. In compliance with the latest market trends, these frills are widely availed by the customers.